I caught the final FringeNYC performance of The Antarctic Chronicles at The Players Loft on MacDougal Street. 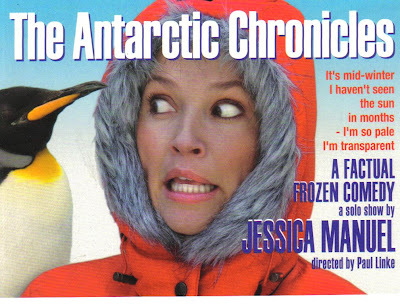 Billed as a "Factual Frozen Comedy", it's a one woman show by Jessica Manuel about her job as a support employee in the Antartic. Interspersed with music, dancing and some silly videos from her time there, it's a zany story. Jessica told why she decided to go in the first place - living a dull, white break life hoping to live extraordinarily. The arc of her excitement of first arriving in Antarctica to practical madness from the months of cold (-80 below!) and no sunshine is nothing short of hilarity. Jessica is a ball of energy and can really tell a story, complete with the crazy miming of her job assignment in the fuel department to time in the galley. Not that I ever had any desire to go to Antartica in the first place, now I know I don't need to go thanks to this story that made me feel like I was there - but in a good way. It was a quick hour of stand up comedy - fun and full of laughter. It didn't hurt that the Player's Loft was cooled down to a welcoming antartic feel on such a steamy day.